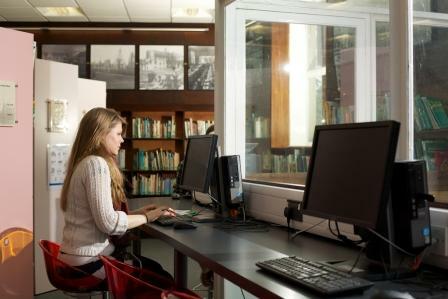 Located just a short walk from Exeter city centre, St Luke’s Library is a great place to study, and you don’t need to be on a course based on St Luke’s Campus to use our facilities. Here’s some information about our opening hours at St Luke’s Library for the 2013-14 academic year. St Luke’s Library offers our usual extended term time opening hours to cover 36 weeks per year, including the weeks before exams and the additional weeks in June to support our PGCE students. We have also extended our opening hours to include Saturday and Sunday mornings, now increasing our weekend opening hours to 10.00 – 18.00 all year round. From Monday 16th September, term time hours resume at St Luke’s. From this date the library’s staffed opening hours will be 08.00 -20.00 on weekdays and 10.00 – 18.00 at weekends so that Library staff will always be on hand to offer support during busy times. Library users are welcome to move to the 24/7 study room after 8 PM (6PM at weekends) but access to collections is not possible after this time. Our 24/7 provision at St Luke’s includes up to 30 study seats and 28 computers (with colour and black and white print facilities), available all year round. For more information on new our opening hours please talk to library staff or why not visit our web pages for full details? This entry was posted in Luke's Library, Using the Library and tagged improvements, St Luke's, study spaces on 10th Sep, 2013 by reg206.